Vlogging in 2017 is not just about being ready with your new camera and all the setup and doing a well-rehearsed show. It’s about spontaneity and being in-the-moment. What today’s viewers want is spontaneous action, and nothing better for a vlogger than to be ready no matter where they are. As good and versatile as your awesome flip screen camera is, many times it just won’t be there when you need it. Backed by the world’s best technology and design, recommended and used by some of the world’s top vloggers, and praised by the top tech critics, the Samsung Galaxy S7 is arguably the best smartphone for vlogging, the camera is fantastic and the accessories are what takes it to the next level. So let’s take a look at the evidence to back it up. Whether it is for a selfie video of you staring at the Northern Lights or commentating at a Lakers game, having the S7 in your hand is going to be your best strategy when it comes to impromptu vlogging. With loads of video recording features, tons of editing apps, and the lifesaving feature to transfer your fresh, hot vlogs to your YouTube channel and other video-sharing sites directly make Samsung S7 the best-performing and most reliable vlogging smartphone in the market right now. How is Samsung S7 the Best Smartphone for Vlogging? The biggest merit of Samsung Galaxy S7 is its high-quality camera that behaves just like an entry-level digital camera. Of course, you cannot compare it with the range of high-end DSLR cameras by Canon and Sony, but it definitely wins brownie points for its size, portability, and ease of use. Boasting of a 12-megapixel rear camera with a pretty wide aperture (f/1.7), the S7 lets you take wide shots with great ease without having to position your mobile against the concepts of physics (like some folks do). Samsung created another fab accessory, the vlogging lens pack with a phone case, wide angle and telephoto lenses especially for this model which does a better job than any third party lenses and accessories. It’s particularly useful for steady shots but don’t pan too much(move it around while shooting) or you’ll get some jello effect. The wide angle shots are great and give your videos a higher quality look, it is about $100 for the set and it is the cheapest way to improve your vlogs. Regarding video output, it can give you a maximum resolution of 4K, but we recommend 1080p at 60 frames per second for flawless, YouTube-worthy uploads. 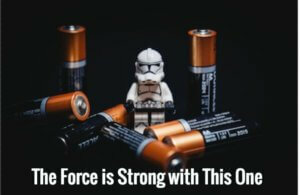 One thing that most vloggers are wary about when it comes to smartphones for vlogging is the battery life. And the S7 does not disappoint. Great battery life a superior feature, crucial for a vlogger. Compared with its predecessor S6, the S7 is capable of storing more juice and is power-efficient. So we tested a full-charged S7 for recording only videos (at 1080p) and found that the battery did last more than 120 minutes. It falls down to less than 10% of the original number, but 2 hours of straight filming is great, and bring a power pack with you and you can keep the show going. Its a still a great deal because 2 hours of shooting power is a superior quality, especially when you want more juice for those extra 5 minutes of filming time. 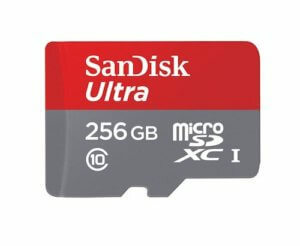 Additionally, the expansion support of up to 256 GB is a godsend if you are a prolific creator like one of your favorite vloggers. The next best feature in the S7 is the improved autofocus, which Samsung likes to call Dual Pixel Technology. Compared to phones such as iPhone 7 and the Google Pixel range, videos shot using the S7 have better clarity and focal lengths between the objects. GSM Arena calls it ‘the best autofocus feature in a smartphone’ and cites its presence of phase detection photodiode in every single pixel of the camera sensor (1/2.5″ Sony IMX260) to further glorify the feature. The effect: it detects and accurately focuses on any object in the frame irrespective of the range level. 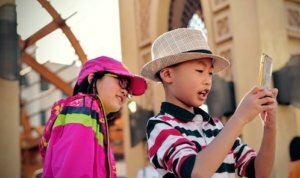 While this technology is not new when it comes to digital cameras, it definitely makes S7 the best smartphone candidate for vlogging purposes. The ability to shoot videos simultaneously using both front and rear cameras is another feature that you can use to create vlogs which you can then edit back together to provide a more indulgent experience to your fans. The S7 supports almost all currently-available apps in the Play Store, so editing and directly uploading them on YouTube, Vimeo, and Facebook is going to be much easier. Plus, it supports Wi-Fi, NFC, and USB 2.0, giving you more options to play with, transfer, and edit your raw videos. If you fancy watching and checking your videos right on the phone before getting down to optimization, the Galaxy S7 treats you with its 5.1-inch Super AMOLED screen with capacitive multitouch. The highest resolution is 1,440 x 2,560 pixels, enough to judge the quality of your videos and how it will look on a larger web player. Another plus point of S7 as a vlogging smartphone is its support for an external mic, which is a big advantage for vloggers. Connect your existing microphone to S7’s audio jack (which Apple users nowadays miss so badly) and vlog away. You will be able to capture stereo 2-channel sound. Using the Rode Mic me connected straight into your earphone input is going to give you a great sound while talking directly into the camera, no wires, no setup required, plug in and speak – Perfect. 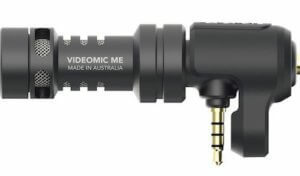 The Rode Video Mic Me is a directional mic that is great for picking up sound directly in front of the mic, meaning you get great vocal sound quality even in environments with louder background noise, saving you time and effort relocating to quite spots etc. The technical features are also superior in S7. In addition to the rockstar optical image stabilization (OIS) feature (which is to die for), with this model, you can also adjust your ISO sensitivity and aperture all the while shooting. The one biggest low point of the Galaxy S7 is its front camera. 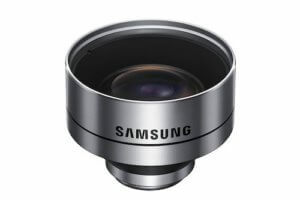 Although Samsung boasted about its selfie lens right after launching the model in 2016, we are not entirely happy with it. With 5 MP, the quality is relatively inferior if you are going to create selfie videos. It is true that megapixels do not really mean much when it comes to vlogging, but the difference becomes quite evident when you look at the videos on your notebook. Why is Samsung S7 Better than the iPhone 7? One great merit of S7 that we saved for the last is its cost. And when one compares it with the equally popular iPhone 7, the cost is one of the biggest deal breakers. Samsung Galaxy S7 is a LOT cheaper than iPhone 7, and if you have a budget in your mind, it is better to go with the former. Samsung’s best smartphone so far (unless you consider the new S8) beats iPhone 7 on the cost, autofocus feature, and battery fronts. Three of the essential parameters, and the reason for us to create this article in the first place. It is true that the online video community endorses Apple’s products like they all are its ambassadors, but if it is the quality that you are looking at, the S7 is going to be your best bet. Which Famous Vloggers Use Samsung S7? 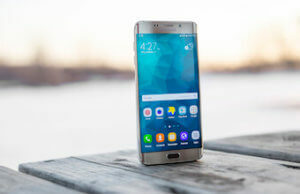 Although famous vloggers prefer using their customized and set-up digital cameras (mirrorless, point and shoot, and DSLRs), there comes a time when even they have to settle for the slim smartphone in their denim’s back pocket. So, if the above features are not enough for you to go to Amazon and book the good-looking S7 right now, it will be reassuring to know that the phone is also used by some of the world’s top vloggers. This is a very limited list, and chances are that many more vloggers are using it to shoot their vlogs. Samsung Galaxy S7 is already a self-sufficient smartphone that will take care of all your vlogging purposes. 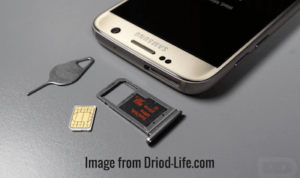 But, if you are one of those advanced users who likes to have more customization, these are the two must-have accessories to go with the S7. 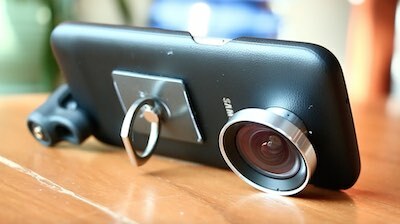 As we have already mentioned, the smartphone wide-angle lens is a must have. Other than acting as a protective cover for your smartphone, this lens cover made of stainless steel outer layer enables you to take wider shots and telephotos with 2x zoom-in capability. You get a sensor extension of up to 50 mm and sharper picture quality without losing any details even if you play them on larger screens. 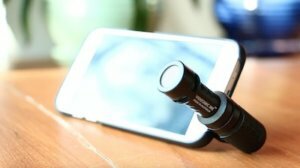 The screw mount is easy to use and fits snugly on the smartphone. Overall, if you are looking to improve the range of your videos and images without hurting the quality, this is the accessory to get. 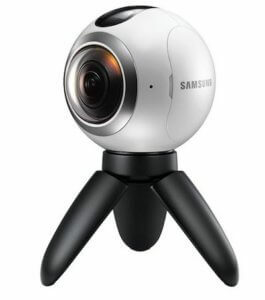 At a time when virtual reality (VR) is taking over the world, the Samsung Gear 360 is the perfect gadget to use with your vlogging smartphone. Treat your viewers with full 360-degree videos and attract more viewers. 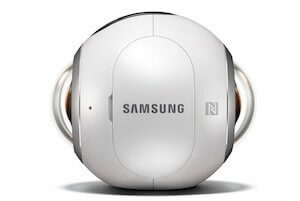 If you are someone who has always wanted to try out new things before it becomes mainstream, getting the Samsung Gear 360 camera with your Samsung S7 should be on the top of your list. You only need to tap a button and the camera immediately starts capturing everything from all angles. Once you have captured what you want, you can instantly play them using your VR gear or edit them directly through your S7 piece. 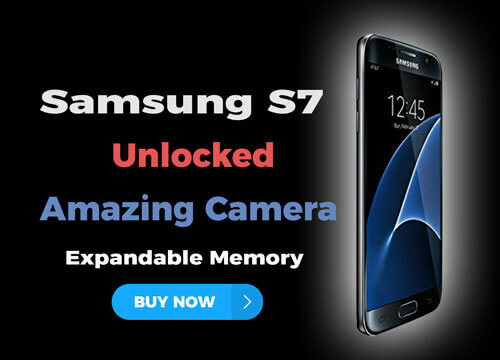 All in all, if you are looking for a smartphone model that has all the features of a vlogging camera which creates high-quality videos and has great battery life, Samsung Galaxy S7 should be your first and the only choice.